Considering the employee perspective cultivates an understanding of the individual and drives success in the company. The Exploded View is an effective tool for helping companies navigate an increasingly digital world. The model is based on six levels. These levels can be broken down into different perspectives and used accordingly – these include the customer, market, company and employee perspectives. In this article, we want to shine a brief light on the employee perspective. You can find a detailed description of this perspective and additional useful tools for your digitisation projects in our free white paper. 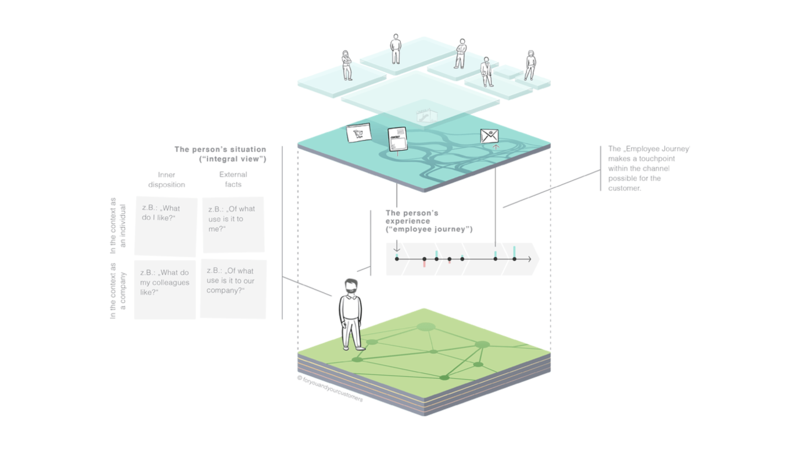 The employee perspective in the Exploded View considers the people working in the company, their situations, routines and experiences (employee journey). The ability to take the perspective of the employee and to achieve steady improvements in their employee journey is certain to make a significant contribution to the company’s success. Many aspects of the employee perspective are similar to those of the customer perspective. In this way, the situation of the employee can be viewed and their motivation (task) and the resulting employee journey understood by slightly modifying the tools applied in the customer perspective. Similar to customers, every employee is different. Companies that accept these differences and integrate them purposefully in the assignment of tasks are likely to be more efficient. Developing an understanding of employees and using it to extract suitable individualised actions can make an organisation significantly more effective. The employee situation can be modelled succinctly using an integral approach. It involves analysing the employee using four quadrants, with the inner attitude and external facts on the one axis and the individual (‘me’) and the collective (‘us’) – usually the team, superiors and peers – on the other. That analysis allows a more prescient understanding of what the employee Wants to do (top left), May do (bottom left), Can do (top right) and Must do (bottom right). But employees are there to complete tasks: a person’s inner attitude is of secondary importance here, and the main focus is placed on external facts – that is, on the Can and the Must. The inner attitude will nevertheless play a fundamental role and ought to be considered in the procedures and tasks. To model this, the work and its associated tasks can also be transferred to four integral quadrants: Emotional Jobs (top left), Social Jobs (bottom left), Functional Jobs (top right) and Compliance Jobs (bottom right). The employee is motivated by an impulse to complete their work. This impulse can come from the person themselves (entrepreneurial task), from the organisation (operational task) or from outside from, for example, a customer or a business partner (order or request). This impulse triggers a series of work steps or tasks, which together represent the employee journey. Companies are well advised to collect and list work or orders that recur regularly. The employee journeys that emerge from the orders should be documented and analysed with the various members of staff. During this analysis process, the stakeholders quickly produce an extensive list of possible improvements that should be reviewed, prioritised and documented. It may even be possible to decide on and initiate some initial improvement actions. Learn more about this and how you can help your company succeed by improving employee journeys in our free white paper.